Over the history of film it seems that criminals from Capone and Dillinger to Machine Gun Kelly and Bonnie and Clyde have had their story glamorized and put on film. 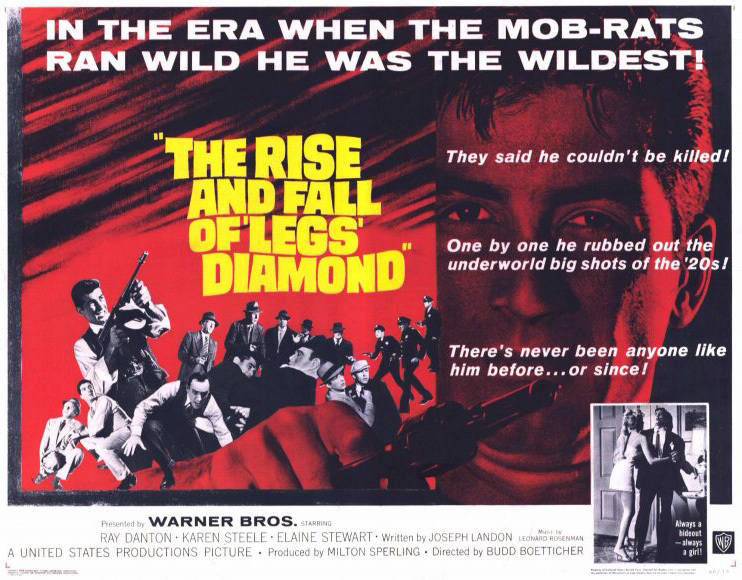 So why not another gangster with the fancy name of Jack “Legs” Diamond. Taking time out from his association with the western genre and Randolph Scott we have director Budd Boetticher serving up this feature film with Ray Danton in the title role of this black and white Warner Brothers feature. 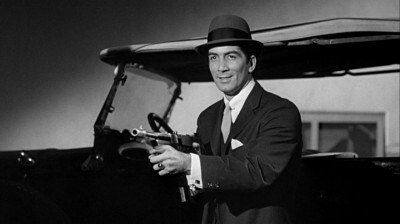 Unlike Warner’s heyday of producing the great gangster films of the thirties this effort plays more like an extended episode of something like The Untouchables for television. Danton portrays our gangland character as a very narcissistic individual who uses everyone in his way to controlling the powers of the underworld. He starts off as a two bit thief who along with his on screen brother Warren Oates finds that petty crimes don’t pay enough. 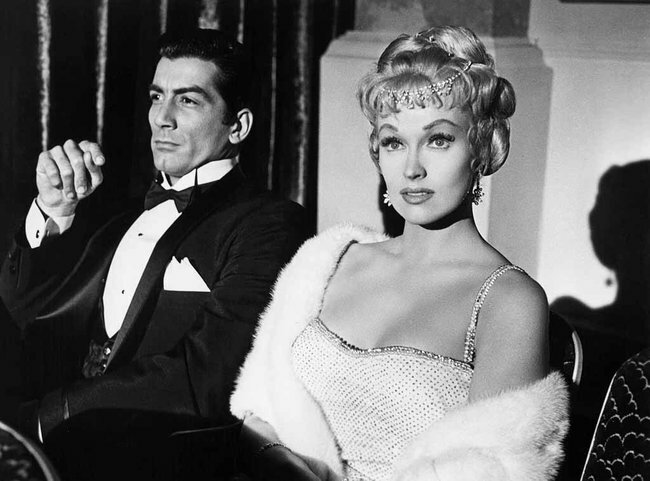 Using the attributes of dancer Karen Steele to his advantage he finds work as dancer in a swank nightclub which gets him into the inner circle of well known gangland figure Arnold Rothstein. He quickly moves up the ladder of Rothstein’s empire as a debt collector and body guard to the head man. He’s even stepping out with the bosses main squeeze Elaine Stewart when his employer isn’t looking. Gunfights ensue in his notorious career that result in multiple gunshot wounds. When these fail to kill him he soon begins to actually believe that he’s indestructible. 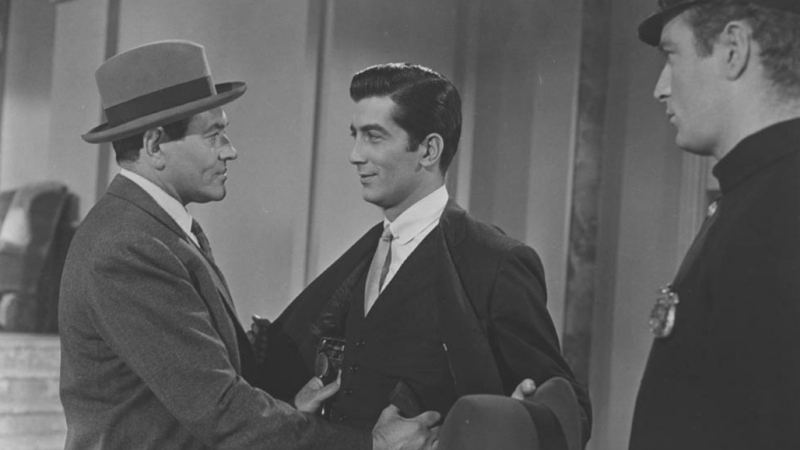 After the murder of Rothstein which the script hints was at Danton’s doing he moves in to take over the syndicate against fellow competitors including Jesse White. Danton’s greed has no limits. He wants it all and with the use of the “tommy gun” is bound and determined to collect his protection money from all the other under bosses. Appearing about every twenty minutes we have police officer Simon Oakland doing his best to either catch Danton in the act or find a witness that will tell of the evil deeds he’s committed. Danton even goes as far as marrying Karen Steele in order to keep her under his thumb and prevent her from incriminating him thus fouling up Oakland’s plans. With the use of the newsreel, Danton sits idly by while on a European vacation and views clips of many of his cronies like Capone and other underworld figures being hauled off to jail. Worried about his empire he returns to find that the more business like figures have taken over. He doesn’t take it lightly and his threats seal his fate. I suspect there is a hint of truth in this 100 minute script but that much of it has been twisted for the screen. The only character in the film that Danton has any concern over is his brother Oates who it appears suffers from tuberculosis though the script never comes out and uses the word. Names like Bugsy, Rothstein and Lepke are thrown in to give it an authentic feel though it still comes off as somewhat phony and second rate. Perhaps that’s due to a film that seems overly melodramatic. Especially when mixing in the romance scenes. Coming off best is probably Elaine Stewart as Rothstein’s lady who is adept at looking out for number one and serves up a very Dillinger like “lady in red” scenario towards the fadeout. Due to the names of Boetticher and Oates, this was something I needed to check out and at the end of the day I prefer them both in the western genre. Even the director of photography was Lucien Ballard who for me is joined at the hip with Peckinpah on The Wild Bunch. 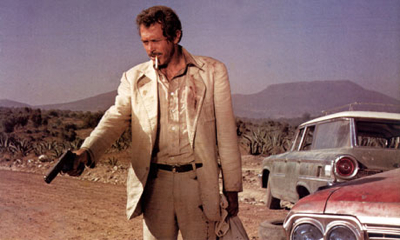 Though it must be pointed out that once the seventies arrived, Warren Oates fit in to the gangland features much more ably with Dillinger and Alfredo Garcia on his dance card. I might like this a little more than you, Mike, but it’s a fair enough assessment all the same. Partly due to the subject matter, it tends to feel like a movie out of time. With Boetticher and Ballard’s names attached, you can’t help but feel it should have been better than it turned out. Perhaps that’s it. I just feel it’s not as good as it could have been. It’s scope is bound up with little more than set pieces and one room locations. I also found Danton pretty one dimensional. Perhaps a bigger budget and leading man of the day like Tony Curtis or Steve McQueen??? ?